We were beginning to pack up the house we rented in Bonnieux in preparation for our return to Tuscany. This was a really great house, luxurious, generous, comfortable, but the odd thing was that the master bedroom had no real closet to hold a winter’s worth of clothes. Instead it had a row of hooks on the wall, which might seem strange given the overall quality of the house. But Maggie and I actually grew to like seeing the few things we came away with hanging, like an ‘installation’, or laundry, visible for us every day. 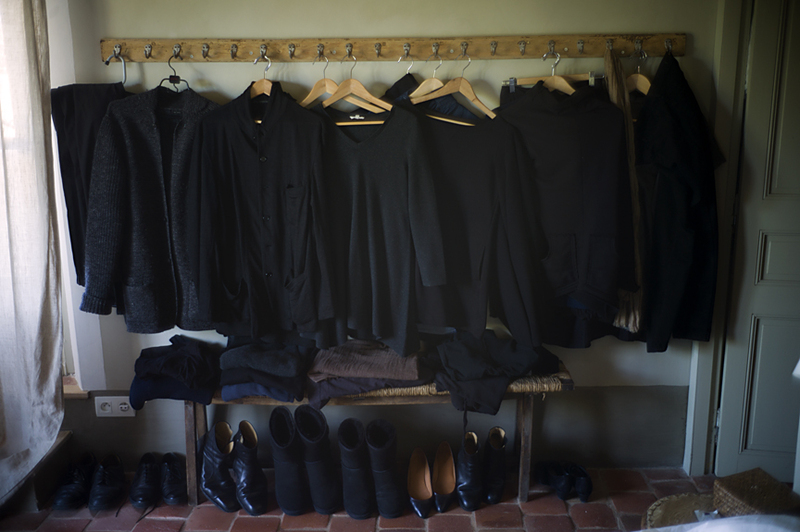 On this day I suddenly saw our wardrobe for what it was; a couple of city people living in the far reaches of Provence with all our city blacks. How strange we must have seemed to the locals as we changed from one shade of dark to another. But what pleased me here was that I now, after months of making still lives, saw it as just another arrangement of objects on a background, and wished I had looked harder earlier. This entry was posted in Still Life and tagged Bonnieux, Clothes, Interior, Provence, Still Life on April 24, 2015 by joelmeyerowitz2014. Best post ever! Made me laugh because it’s so true. Happy trails, back to Buonconvento?